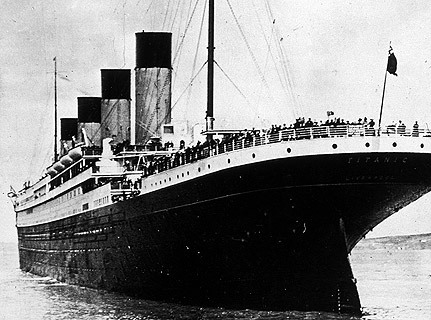 Travel Pennies: Live tweets from the Titanic... really? Live tweets from the Titanic... really? So, the world has gone Titanic bonkers. It's like it's 1997 all over again, and we're all sticking pictures of Leonardo DiCaprio up on our walls. For a little while, I was getting sucked in. The 12 year old girl in my head was momentarily thrilled that the Sunday Times gave away a free Titanic poster a few weeks ago, because she thought that it would fill that tiny space of wall left in her bedroom with the perfect shot of Jack. Turns out, it was a poster of Titanic facts. There weren't even any stickers. Psh. I was also excited at the prospect of the Titanic series on ITV, until I, you know, watched it. And realised it was God awful. So as the 100th anniversary of the sinking looms this Sunday, we're hearing a lot about the ship. There's a part of me (not the 12 year old) that finds all of this fascinating, as any major disaster has the potential to. And yes, I do reeeeally want to go and see the movie in 3D (that may be the 12 year old talking). Oh, but I loved the film. I watched it twice, and gave some great hysterical crying. Somewhere at my parents house there's a tape, with only My Heart Will Go On. Every time I heard it on the radio, I would press record, so I could listen to it 'on repeat'. My local radio station, Southern FM, had a special movie edit, which interspersed quotes from the film throughout the song (I actually think most radio stations had it, but at the time I thought we were special). But even with all of my nostalgic Titanic love, I must admit this is getting a little much. I realised this when my friend, sick of my excitement about the 3D movie, explained why she didn't want to go. "Do you really want to watch corpses float towards you? When actual people actually died?" Amid all of the excitement, I admit that I had almost forgotten that this did actually happen. The Hollywood version of events is so stuck in my head that I, and I think we, have removed it from reality. Suddenly it's not so exciting. And when I got a press release this morning, informing me that on Sunday, the Maritime Museum of the Atlantic in Halifax will "use Twitter to broadcast the vessel's original wireless transmissions" my nose screwed up a little. In real time, there will be a Twitter feed to let us know what was happening 100 years ago. So we can play along at home? I'm not convinced. "As the largest and grandest ocean liner of her time, Titanic was equipped with the most modern wireless technology available. When disaster struck, that technology proved invaluable as it was crucial in saving many passengers and, also, provided the world over with the stunning news of the loss." Still not convinced that this is Twitter fodder, I'm afraid. I do want to make it up to Belfast to check out the Titanic exhibit, which will hopefully replace some of my Leonardo DiCaprio trivia with some useful knowledge. Early reports have been good, so I'm planning on making my way up there soon. But I won't be going near Twitter on Sunday.